Aren't they adorable! Way back when we found out Calvin was going to be a boy, Ninja Turtles for Halloween just stuck in my head. I tried to round up an April O'Neil costume, but ones I found were less than appropriate for a mother, so I went with wearing a yellow-ish cardigan and calling it good. Be careful with those nunchucks, Wes! Cheese! I was able to round up all of their outfits second hand from our Facebook for sale page for less than $20. Calvin's hat was blue, but I added purple felt to cover it up so we could have four different turtles. Henry's favorite is Leonard, blue, Wesley just seems like a Michelangelo, and a friend had a Raphael adult tee and mask for Russ, so that left Donatello for Calvin. Our local YMCA had a Healthy Halloween event we attended last weekend. Russ and Henry had some fun "fights" with their weapons before we left. The boys got lots of fun non-candy items. These teeth were a hit with Henry. They even glow in the dark. We walked all over the building picking up fun little items. Henry also made a foam frame. And played spine align bean bag toss. The last spot was a place to make a healthy trail mix. It was a perfect bedtime snack. They came home with new toothbrushes, little soccer balls, a Halloween straw, and much more. The boys had a blast and we'll for sure go back next year. In central Iowa, Trick or Treating actually takes place on October 30th, and it's called Beggar's Night. If you're interested in the history of it, you can find it here. Russ took the two big boys out. It was a great Halloween season! Now to see if I can get us in themed costumes again next year! If you want to check out last year's costumes, you can find it here! 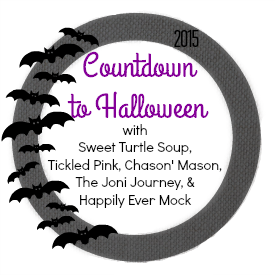 Linking up as well with The Halloween Costume Link Up.